They wrote tens of thousands of religious manuscripts, recorded scientific discoveries, translated Greek and Persian philosophy and recorded historic events as they unfolded during the old days. Much of what we know about Armenian history and culture today, has been preserved in these manuscripts and historic books. 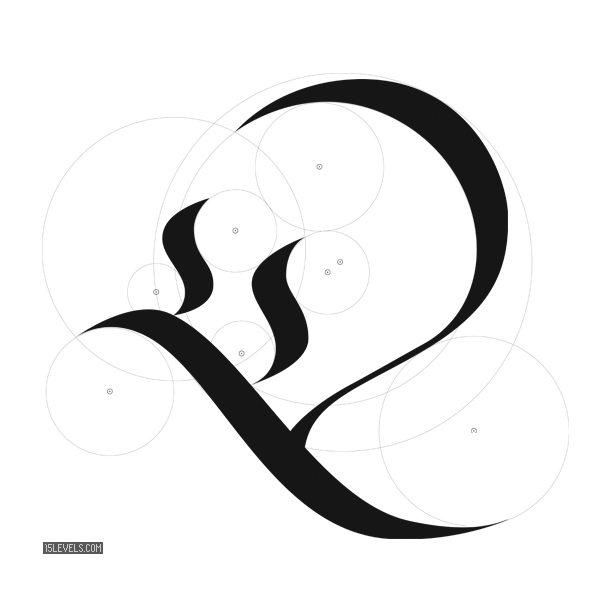 As the writing culture expanded among the Armenians so did the art of calligraphy. In fact up to the XIV century, Armenian books were all handwritten, facilitating the development of a rich tradition of calligraphy. 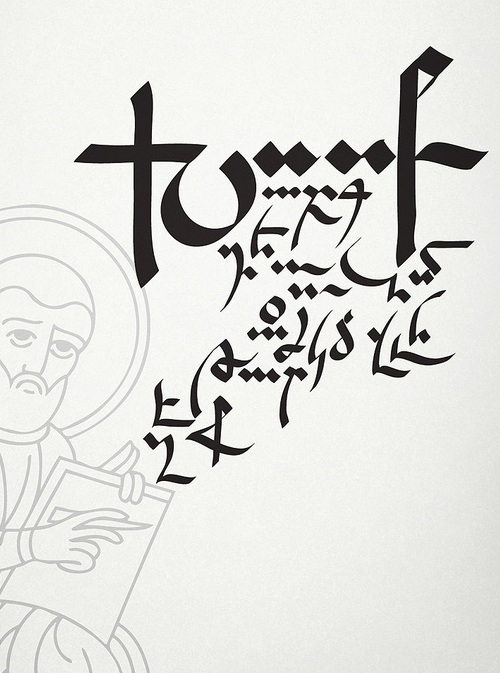 Among the first words and sentences written in the Armenian alphabet by Mesrop Mashtots were: “To know wisdom and gain instruction; to discern the words of understanding…” The Armenian alphabet reveals a complex system of thought interlinked with mathematics, metaphysics and philosophy. The Armenian word for alphabet is ayb-u-ben (Այբուբեն), named after the first two letters of the Armenian alphabet. It is composed as a prayer, beginning with Ա – Astvats (=God) and ending with Ք – K’ristos (=Christ). Calligraphy was a well-established practice in medieval Armenia, with a calligrapher typically in possession of a wide assembly of tools. 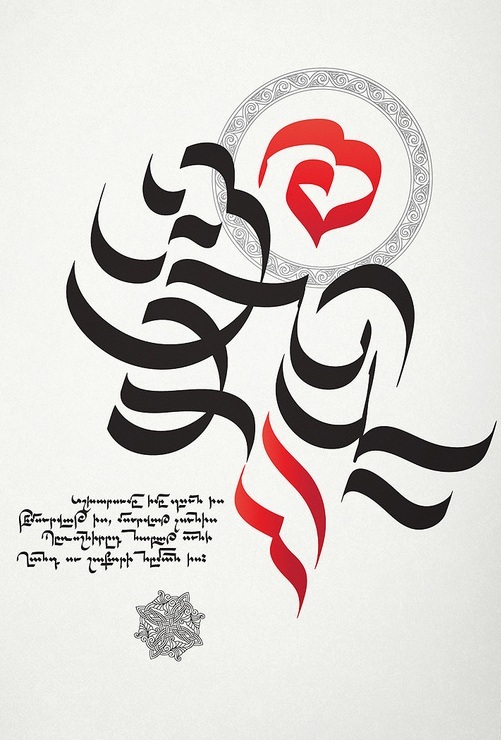 Arab writers and calligraphers often used and praised Armenian colors, especially “vordan karmir – որդան կարմիր” known in Europe as “Armenian red”, and in the Arab world as “kirmiz” – a deep crimson dye (RGB 220, 20, 60) extracted from an insect (Pseudococcus) common to the Ararat Valley. Armenian manuscripts are highly regarded for their artistic value. As works of art, these manuscripts have inspired a period of scientific and philosophical learning for a number of academic communities, and are themselves living cultural remnants of exceptional aesthetic value. The famous Matenadaran Institute of Ancient Manuscripts in Yerevan, Armenia holds one of the world’s richest depositories of medieval manuscripts and books which span a broad range of subjects, including history, philosophy, medicine, literature, art history and cosmography. 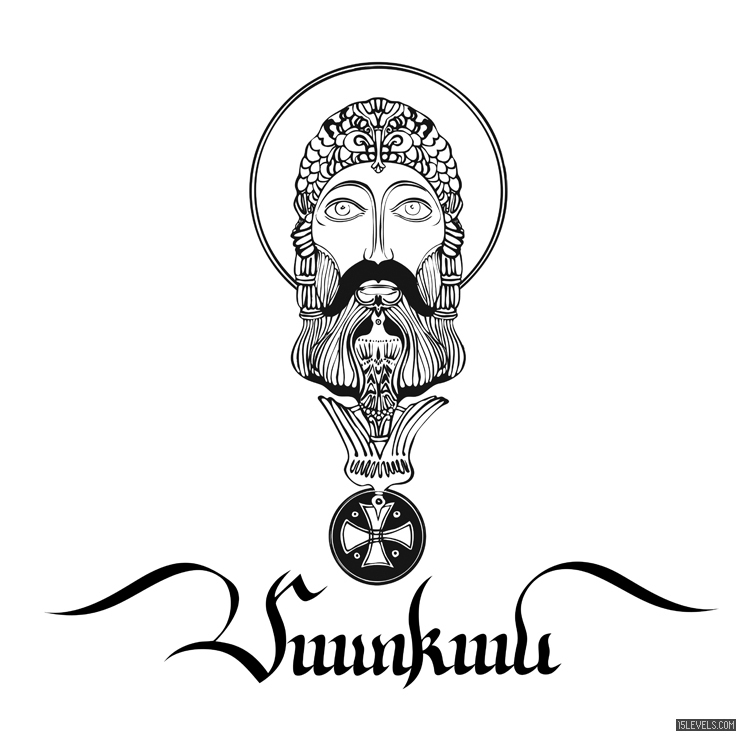 Although much has been destroyed (e.g., over 10,000 manuscripts were burned by Seljuk Turks in 1070 after a 40-year siege of Kapan, the capital of the Suinik province of the Armenian Bagratuni Kingdom), over 30.000 have survived and are preserved until today in Matenadaran. 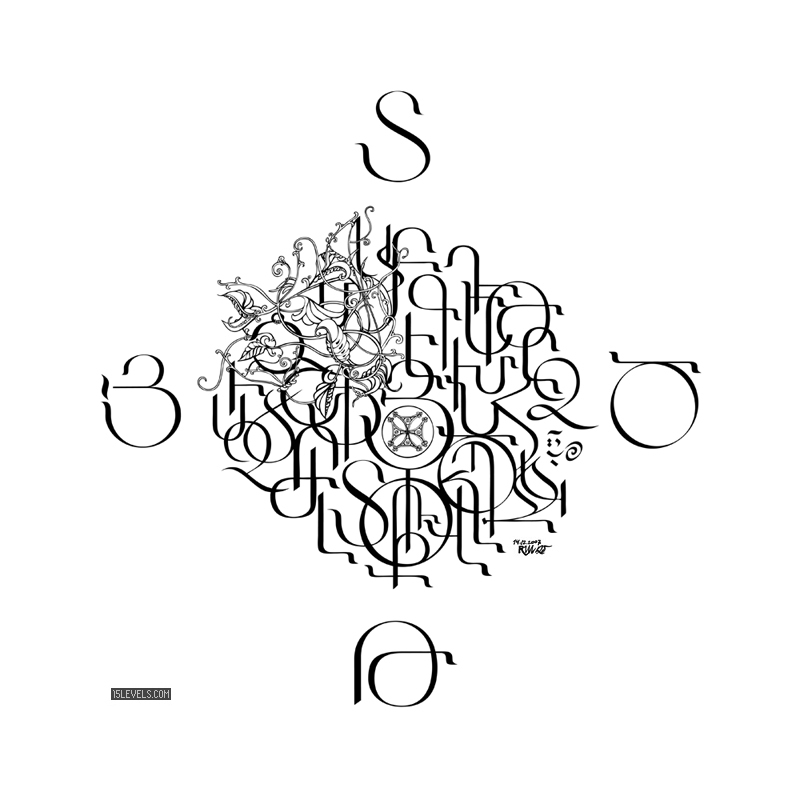 There are various forms of scripts in Armenian calligraphy. Below a short description of the main scripts with graphic examples. 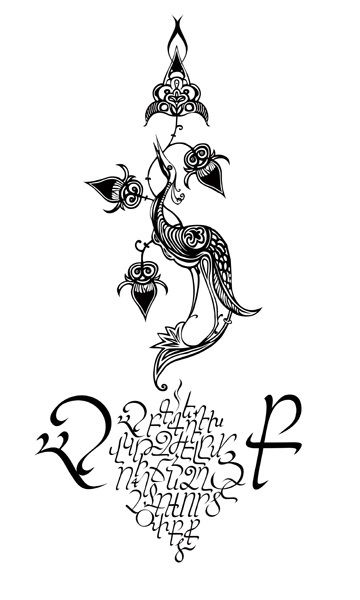 Erkata’gir (Երկատազիր) The script is monumental by style, majuscule, the letters are large, very erect, with gracefully rounded lines connecting the vertical elements of the letters or springing from them. All the letters of the Erkata’gir script were written on the base line between two imaginary parallel lines, with ascending and descending elements being only slightly extended with the exception of two letters whose elements extend more drastically. Across the range of manuscripts, up to 10 varieties of this script are observable. 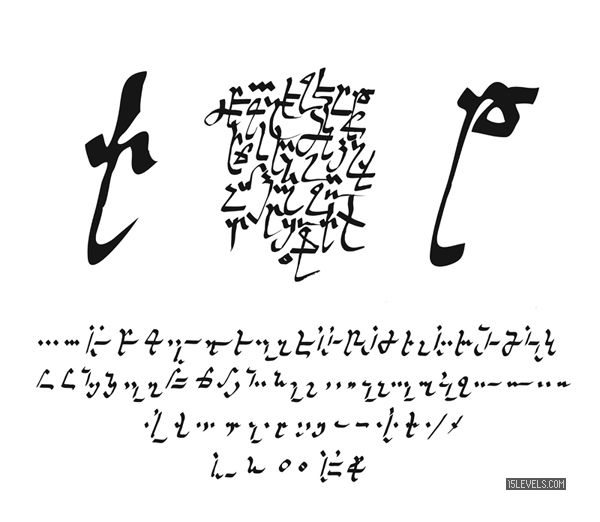 The Bolor’gir (Բոլորգիր) script developed more elegant and graphic forms and although by its definition a round script, the characters are slanted and letters appear to have sharp corners. There are two varieties of Bolor’gir: the Cilician and the Eastern (Armenia proper), with the former being more articulate and precise, while the latter retains some of the cornerstone elements of Erkata’gir. 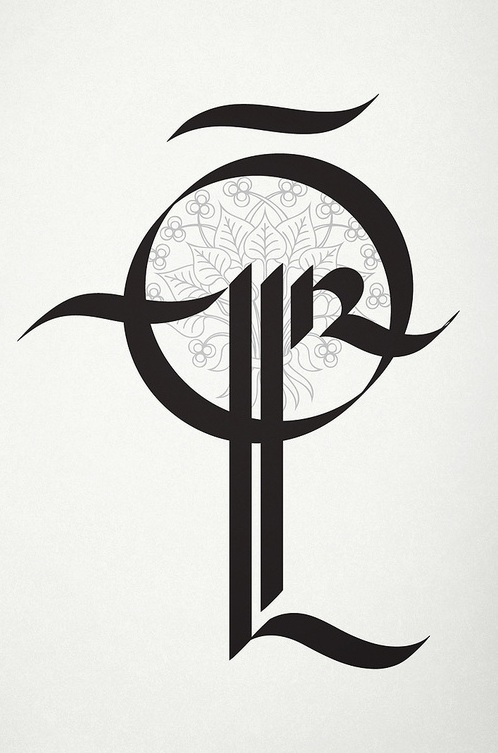 Sła’gir (Շխագիր) cursive script is rarely seen in manuscripts and was used mainly for notes. Executed with reed pens, its main characteristic was that it possessed an equal width of all elements. In general, the shape of the letters recalls that of an irregular Bolor’gir, although some elements of Straight Erkata’gir are in evidence as well. 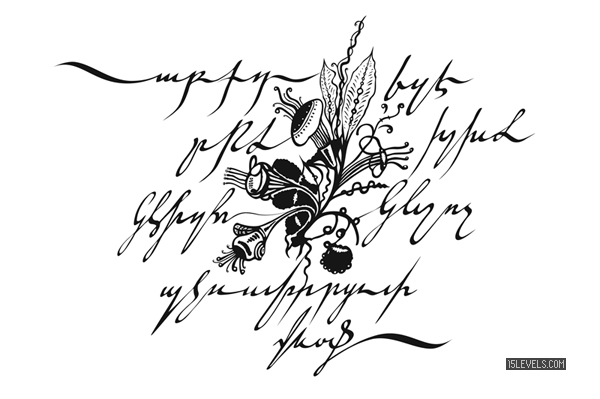 This became the basis for contemporary hand-written scripts in Armenia. Notr’gir (Նոտրագիր) notary script is a blend of Bolor’gir and Sła’gir with predominant small and cursive forms. It was used in the seventeenth and eighteenth centuries. Thank you for showing us these beautiful forms of writing. My favourites were “Erkata’gir Alphabet” – Ruben Malayan, and the Armenian music notes in a circle. Don’t mention it, thank YOU for your wonderful work!! It’s very inspiring!